This article is about Chinese state. For one of the Three Kingdoms, see Shu Han. 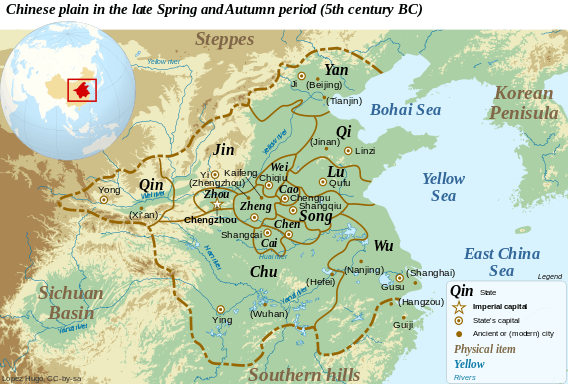 The State of Shu (Chinese: 蜀) was an ancient state in what is now Sichuan Province. Shu was based on the Chengdu Plain, in the western Sichuan basin with some extension northeast to the upper Han River valley. To the east was the Ba tribal confederation. Further east down the Han and Yangtze rivers was the State of Chu. To the north over the Qinling Mountains was the State of Qin. To the west and south were tribal peoples of little military power. There are very few mentions of Shu in the early Chinese historical records until the 4th century BC, and although there are possible references to a "Shu" in Shang Dynasty oracle bones inscriptions, it is not clear if they refer to the kingdom. The Shu was first mentioned in Shujing as one of the allies of King Wu of Zhou who helped defeated the Shang in 1046 BC at the Battle of Muye. However, shortly after Zhou's conquest, it was mentioned in Yizhoushu that a subordinate of King Wu led an expedition against Shu. After the battle of Muye, northern influences on Shu seem to have increased and then decreased while the Shu remained culturally distinct; archaeology suggests contacts with Shu in the late Shang and early Zhou period, but little evidence of influence from later Zhou. The expulsion of the Zhou from the Wei River valley in 771 BC probably increased Shu's isolation. Written accounts of Shu are largely a mixture of mythological stories and historical legends found in local annals and miscellaneous notes. There are a few names of semi-legendary kings, such as Cancong (蠶叢, meaning "silkworm-bush", later claimed to be founder of silkworm cultivation in Sichuan), Boguan (柏灌, "cypress-irrigator"), Yufu (魚鳧, "cormorant"), and Duyu (杜宇, "cuckoo"). According to Chronicles of Huayang, Cancong was the first of the legendary kings and had protruding eyes, while Duyu taught the people agriculture and transformed into a cuckoo after his death. In 666 BC a man from Chu called Bieling (鱉靈, meaning "turtle spirit") founded the Kaiming (開明) dynasty which lasted twelve generations until the Qin conquest. Legend has it that when Bieling died in Chu his body floated upriver to Shu and came back to life. He was successful in managing a flood and Duyu then abdicated in his favor. A later account states that the Kaiming kings occupied the far south of Shu before travelling up the Min River and taking over from Duyu. Shu is represented by star Alpha Serpentis in asterism Right Wall, Heavenly Market enclosure (see Chinese constellation). (together with Lambda Serpentis in R.H.Allen's works). 1 2 3 4 Terry F. Kleeman (1998). Ta Chʻeng, Great Perfection - Religion and Ethnicity in a Chinese Millennial Kingdom. University of Hawaii Press. pp. 19–22. ISBN 0-8248-1800-8. ↑ Sanxingdui Museum; Wu Weixi; Zhu Yarong (2006). 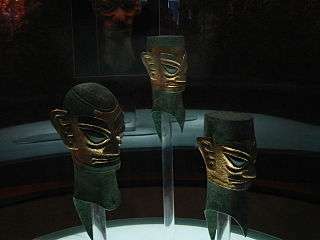 The Sanxingdui site: mystical mask on ancient Shu Kingdom. 五洲传播出版社. pp. 7–8. ISBN 7-5085-0852-1. ↑ Chang Qu. "Book 3 (卷三)". Chronicles of Huayang (華陽國志). pp. 90–91. ↑ Steven F. Sage. Ancient Sichuan and the Unification of China. State University of New York Press. pp. 45–46. ISBN 978-0791410387.